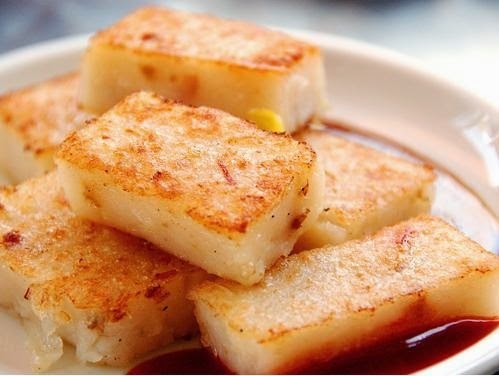 (2) 碗稞Small-dish rice cake: This one comes in two flavors, sweet and salty. The sweet version is easy to make, simply mix rice powder with water to make a paste, then add white and brown sugar water, pour into a small dish (usually that for placing a broad porcelain soup spoon) and steam for about 20 min. Done. 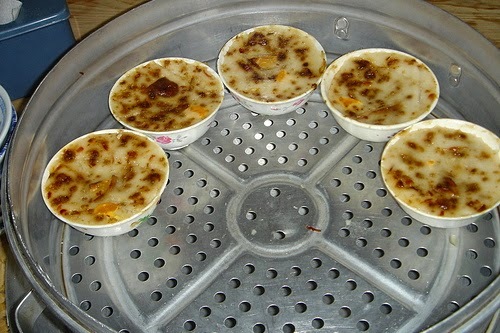 The salty version requires ingredients such as chopped-up dried goods such as radish, mushroom, shrimp, green onion, and some minced pork, to be added after the first steam-cooking, then steamed again. This can be prepared in small dishes or in rice bowls. In Tamsui, small-dish rice cakes were usually sold by kids out to make a buck, after school of course.